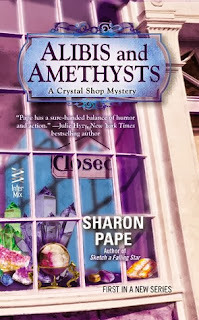 by Theo Brock from Alibis and Amethysts, the first book in the new Crystal Shop Mysteries, by Sharon Pape. I'm Theo Brock, a detective with the Sedona, Arizona Police Department. My partner, Cal Anastos, and I make up the entire detective squad here. If that surprises you, you need to remember that Sedona has a residential population of only about 10,000. Of course it may not seem like that if you're here at the height of the tourist season when the population can swell to six digits. But since folks on vacation tend to be looking for a stress-free, good time, we don't get a whole lot of serious crime here. Between you and me, when the worst cases are a pickpocket, a drunk and disorderly and a tiff between neighbors it's downright dull. Sometimes we'll get a call about a wild animal showing up in someone's backyard. A good half of those wind up being a cow or a particularly hefty rodent. Anyhow, the uniforms take care of most of that stuff. You may be wondering why I don't just move to a more exciting, crime-ridden city if I'm that bored here. The answer is all about how I spend my time off. I have a small house down in the Verde Valley where land is a lot cheaper and keeping a few horses is as natural as keeping cats or dogs in other parts of the country. I'm a cowboy at heart, born some hundred and fifty years too late. Nothing would have suited me better than to spend my life rounding up cattle or outlaws in the Old West- a loner, with a horse for my best friend. I've been told I have a brusque manner and less patience than a grizzly coming out of hibernation. I've never argued with either assessment. More importantly though, I'm also known to be a standup guy a partner can count on if things get dicey. When Peggy turned up dead, I had a lot of mixed feelings. On the one hand, I was sorry to see a law-abiding citizen cut down like that. But on the other hand, Cal and I finally had a case we could sink our teeth into. Unfortunately Sierra and her friend Jaye were our prime suspects. That's what happens when your business competition winds up dead in your backyard. I say "unfortunately," because I'd considered Sierra something of a friend up till then. And I was really going to miss her baking if I had to put her behind bars. I'm a sentimental, old fool that way. Right from the start of the investigation, both Jaye and Sierra were serious thorns in our sides. Maybe Cal and I were naive to think they'd just keep their heads down and their noses out of any additional trouble. What happened to the good old days when the worst thing a suspect could do was try to run before you had enough evidence to arrest him? There were definitely times during this case when I'd have preferred chasing our suspects instead of bumping into them every time we turned around. One thing is for sure, if the future of law enforcement includes perps trying to solve their own cases, I'm outta here. Stop by and say "hi" on Facebook! I wish some of these well-meaning citizens would stay out of our way and let us do the investigating! I've told them so, too, but do they listen???? It's good to hear from a fellow officer of the law! Love your books, I'm a fan! Lol fun post, thank you!